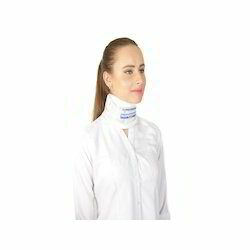 Our product range includes a wide range of cervical collar soft, hi- headache band, cervical collar hard adjustable, cervical collar soft eco, cervical collar and cervical pillow. With the rich industry experience and continuous support of our team of experts, we are involved in offering a wide range of Cervical Collar Soft. This product is made of high density PU foam and provides comfortable support, proper fitting and better life. Moreover, it also provide very strong fitting of the brace around clavicle region. It Gives Compression And Give Relief From Headache. Note-it Is Not A Magic Remedy,consult With Your Dr,if Not Getting Relief. We introduce ourselves as reputed and trusted organization to offer a broad array of Cervical Collar Hard Adjustable. 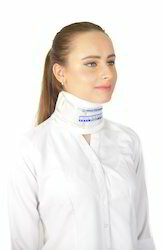 Offered range of product has good shaped for comfort and to give the correct support to help relieve the pain suffered from whiplash, stiff neck and muscular tension. These products can adjust the two rotary knobs on the back of the collar to regulate the length of sliding rail, make the collar fit and do not affect blood circulation. We are one of the prominent names to offer a wide array of Cervical Collar Soft Eco that are highly appreciated and demanded by our clients. It is a pneumatic traction device which is used for neck, especially for the nerve root type cervical vertebrae spondylosis pneumatic traction. Moreover, it is easy and safe to use and can play the role of clinical remission effectively. Air pressure around the neck builds up in a vertical direction in order to soothe and stretch the tight muscles and relieve joint pressure felt in the area of the neck. We are the Manufacturer, supplier & Exporter of Cervical Collar Soft Classic. Cervical Collar Soft Classic Made of high density PU foam providing comfortable support, proper fitting and better life. 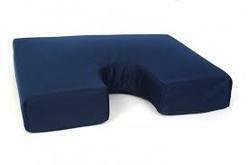 We are one of the reputed organizations engaged in offering Cervical Pillow in the market. 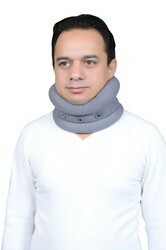 This product is designed to keep the neck in a little hyper extended position at night. Its anatomical design offers proper support and rest to the neck and relaxes the muscles. Moreover, its optimal foam density makes it soft and hence comfortable. A cervical Collar(also neck brace) is an orthopadeic medical device used to support a patient's neck & head. It is also uesd for those patients who have had traumatic head or neck injuries. Cervical collar are incorporated into rigid braces that limit the head & chest together. · Cervical orthosis, is an advanced Neck Brace, with scientific design that ensures complete immobilization with perfect comfort. 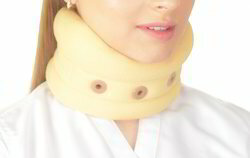 · It is known as a gold standard in cervical immobilization. · Made from a special lightweight high density, non-absorbent, sturdy foam, that is easy to clean and maintain. · Mandibular (front) and occipital (back) splints limit flexion and extension movements of cervical spine. · Very effectively use in Cervical spondylitis, Post-operative care of the cervical vertebral fractures, Burns care of the cervical region, Release and transportation of the accident victims and all other Ortho and Neuro condition that requiring firm immobilization of the cervical region. · The Collar is Hypoallergenic, Eco friendly, Better patient compliance and providing ultimate comfort. 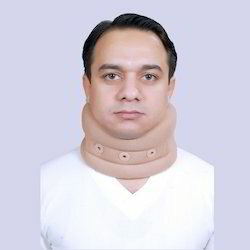 A cervical collar is an orthopedic medical devices used to support a patient neck and head . Cervical collars are also used therapeutically to help realign the spinal cord and relieve pain. 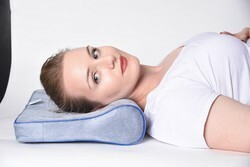 Cervical Pillow is designed to keep the neck in a little hyper extended position at night. It cures the cervical problem when you get sleep. It is optimal foam density makes it soft and hence comfortable. 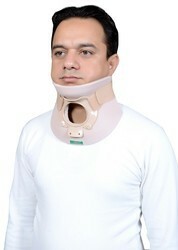 Sort Cervical Collar Grey Colors As Comfortable Grip..
Medicaly design for the patients.